Don't let your hayfever ruin your Summer plans! 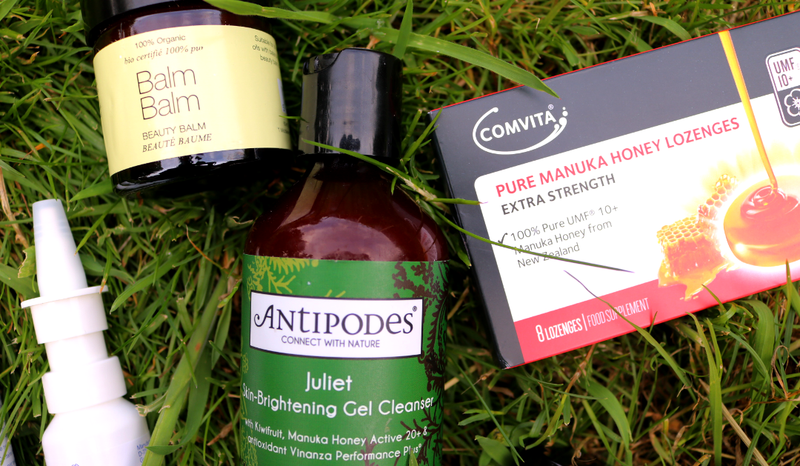 Here's my edit of natural products which can help to alleviate your symptoms and help you look your best, so you can go outside and enjoy the glorious weather. Luckily, I've found some natural products which help to take my hayfever symptoms from severe, down to a much milder level. I still have to take anti-histamines every day (I sadly haven't found anything natural-based yet that replaces those), but the rest of my symptoms are much more manageable now, so I hope some of these products and tips can help out my fellow hayfever sufferers this Summer! 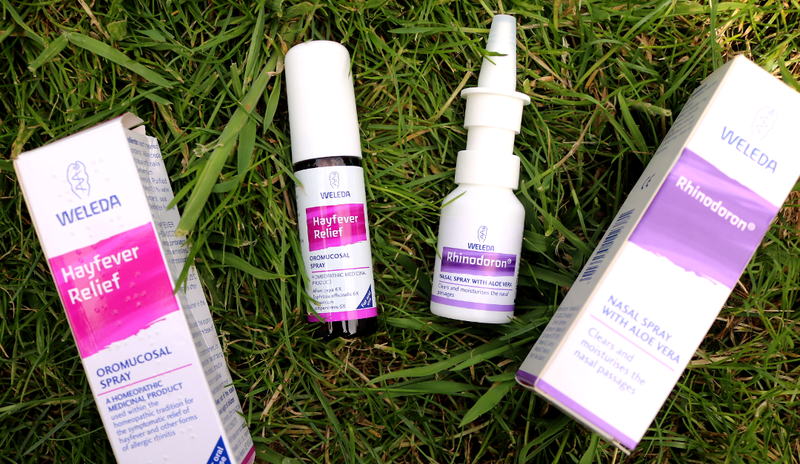 One of the most popular natural hayfever products on the market is Weleda's Hayfever Relief Oral Spray. This homeopathic medicinal product contains a unique blend of Allium Cepa 6X, Euphrasia officinalis 6X and Gelsemium sempervirens 6X, and provides much-needed relief from all the main hayfever symptoms, as well as other types of allergic rhinitis. The vegan-friendly formula is easy and convenient to use; simply spray directly into the mouth up to three times a day, and it can be used by adults, the elderly and children over the age of 12. It does have a slightly bitter alcoholic taste as it contains ethanol, but it's not too bad. When I first tried this, I found that I needed to use it every day for about two weeks before I started to see some benefits from it, so I'd recommend sticking with it to see if it works for you. Another very useful product from Weleda is their Rhinodoron Spray which is a godsend for when the pollen count starts to climb and it's dry outside. This clever nasal spray is formulated with Aloe Vera which helps to clear congested nasal passages, but also keeps it moisturised at the same time. I always find that hayfever severely affects my sinuses, especially when the air is really dry, so this has been an amazing find! I've personally found it a lot more helpful than the nasal sprays that my GP has prescribed in the past so I can't recommend this enough! 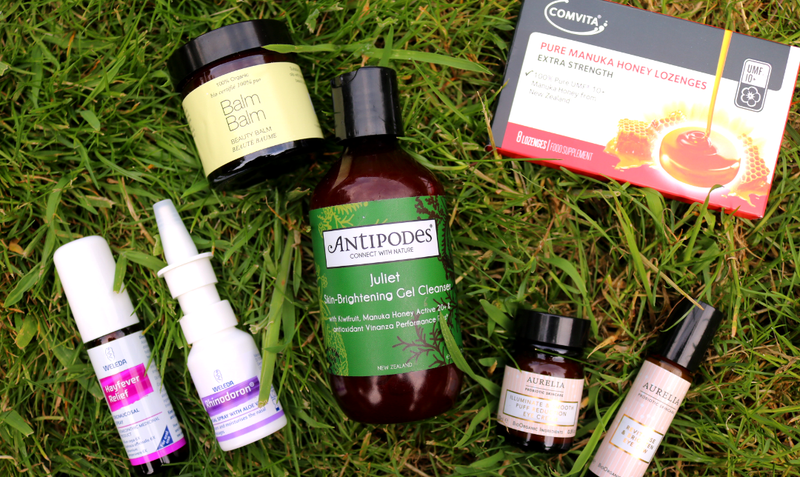 Did you know that most multi-purpose balms can help with your hayfever? By applying a small amount of balm to the inside base of your nostrils, you can trap some of the pollen and stop it from entering the nasal passage, thus reducing the level and severity of the allergic reaction and its related symptoms. Pretty clever huh? I find that this helps me a lot and I always notice a difference when I forget or don't use it. Multi-purpose balms like Balm Balm Beauty Balm are also brilliant for their intended use and that's for moisturising any dry and cracked skin areas, so if your nose feels sore after sneezing, rub a little of this on it to instantly soothe and hydrate. If you've been outside, make sure to wash your face when you get in to remove traces of pollen from your skin and eyes. A gentle cleanser like Antipodes Juliet Skin-Brightening Gel Cleanser will do this perfectly (as well as removing pollution and daily grime), or opt for a cream cleanser if you have dry skin. Just ensure that it's a cleanser that you're happy to use over and around your eyes! Tickly sore throats are no fun, so I always have a pack of these Comvita Pure Manuka Honey Lozenges in my bag. Made from 100% pure UMF certified 10+ Manuka Honey from New Zealand, these are the best throat soothers that I've ever used. My eyes are the biggest giveaway that I'm suffering from hayfever because they get SO puffy which is not a good look for me as it's something that really affects my confidence and makes me incredibly self-conscious. If you're the same, investing in some high-quality skincare that specifically targets the eyes will make a huge difference. 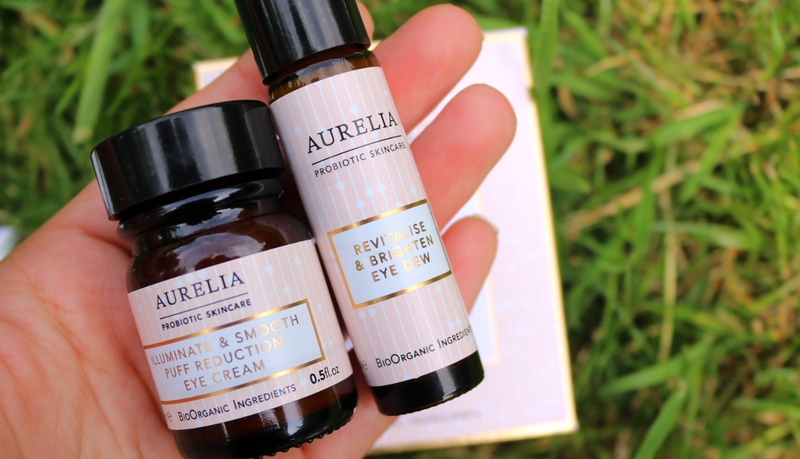 I've been enjoying using the amazing Aurelia Probiotic Skincare Eye Revitalising Duo over the past month and it's a game changer for sure! Aurelia are famed for their probiotic ingredients which are found throughout their skincare range, as they help to protect, restore and balance the skin from within, whilst also reducing the ageing damage from free radicals, pollution and stress. Couple that with some innovative anti-ageing formulas and you have an eye care duo that you're going to see some results from. The duo consists of two products which work in synergy with each other so you layer the cream over the serum. There's the Revitalise & Brighten Eye Dew which comes in a cooling rollerball applicator that gently gives the delicate undereye area a lymphatic massage that feels so lovely to apply. This serum contains a unique eye complex formula which includes Jujube and Olive extract which has been scientifically proven to show an age correction improvement of 5 years in just 28 days of use. It really does give you a noticeable difference and my fine lines look virtually diminished since I started to use this! After applying the serum, there's the Illuminate & Smooth Puff Reduction Eye Cream which feels rich and very hydrating, yet light and is easily absorbed at the same time. Packed full of Probiotics, and BioOrganic botanicals such as Arnica, Centella Asiatica and Butcher's Broom, this powerhouse of an eye treatment reduces the appearance of wrinkles, blitzes puffiness and brightens dark circles. If you have the budget available to try this duo - do it! Do you use any natural products for hayfever? Have you tried allergy desentization therapy? It could help you get rid of an allergy whatsoever. It is usually done throughout the autumn and winter, but the following spring would be already easier.